The word eclectic comes to mind when we think of this local favorite. You may find Houston’s own hipster motorcycle gang, Todo Moto, having a brew, or Rice professors engaging in obscure discourse, either way you’ll have a good time. Cecil’s Tavern is staffed with some of the most exacting and engaging bartenders around, who are tough, smart, and great listeners. Whether it’s their in-depth knowledge of wine or their ability to sympathize with a sad customer having a rough day, they always seem to have an innate sense of just what the customer wants. 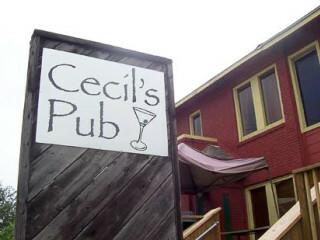 Whether or not you want to shoot some pool, lounge in a nook on a comfy couch, or eat a hotdog while watching the busy world go by, Cecil’s Tavern is your one stop bar for all things chill. Part of a Houston bar scene institution, it's been around since 1985 and is still goin strong.